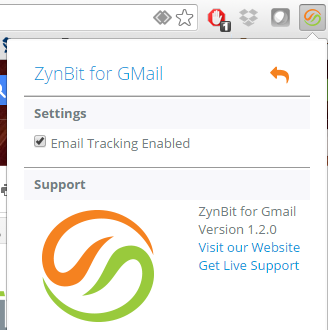 To get help for ZynBit, go to the ZynBit Webpage at www.zynbit.com and select contact us, or choose the help option from the ZynBit area of your email toolbar. When using the Outlook client, look at the ZynBit Area of the browser toolbar and click the Help icon to display the following screen. Choosing Live Support will connect you to live Chat with a ZynBit specialist. 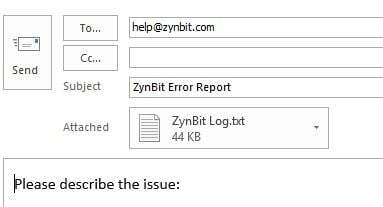 Send Error Report will create a log file and attach it to an email for ZynBit support. This is particularly valuable whenever software errors are encountered. The Web option will connect to our Website homepage. Help will connect to the ZynBit Frequently Asked Questions page which has answers to many common questions available on a self-serve basis. 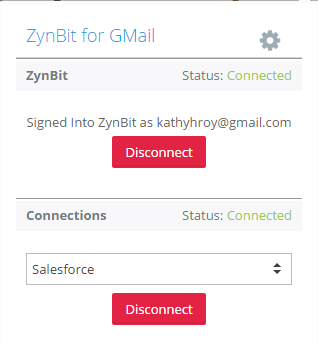 When using Gmail, ZynBit traps Email error events behind the scenes in our database so that the support and development team can refer to the logs in the event of problems and questions. A Link to Live Support is provided by selecting the Gear on the configuration menu.